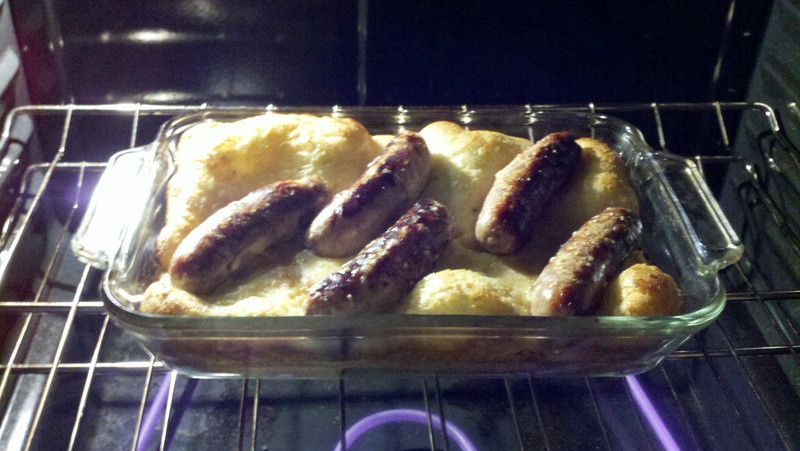 Have you ever heard of Toad in the Hole? If you're from the USA, you might think of it as an egg, fried in the center of a piece of toast, but if you're from the UK, you'll think of it as a delicious traditional dish consisting of sausages cooked in a Yorkshire pudding batter and served with a savory onion gravy. Chris and Claire mentioned it to me when I decided to do a bunch of British foods in honor of the London Olympics. As far as I'm concerned, this is one of those "How can this not be good" dishes! I had never made it until recently, but it's so easy to throw together, I'll definitely be making it again soon! And no, I have no idea why it's called Toad in the Hole. I guess the sausages are supposed to be the toads, but seriously, does that look like a toad to you?? Yeah, me neither. Fry the sausage until lightly browned and all the fat has rendered. Place sausages in a 8x10 baking dish. To prepare the batter, place milk, eggs, flour, salt, pepper and butter in a mixing bowl. Whisk (or use an electric mixer) until smooth. Pour batter over sausages and bake, uncovered in a 400 degree oven for 30 minutes. The batter will become puffed, crisp and golden brown. Serve immediately with onion gravy. To be quite honest, I can't think of any helpful hints for this one. It's all pretty straight forward. And when you're making it, your time manages itself. While you're frying the sausages, you mix up the batter. While it's baking in the oven, you make the onion gravy. It's really just that simple!